This built in entertainment centre is made from Tas Oak. It features centre cupboards for components, media storage drawers, sub woofer cupboard and side displays. The bulkhead includes provision for a motorised projector screen. 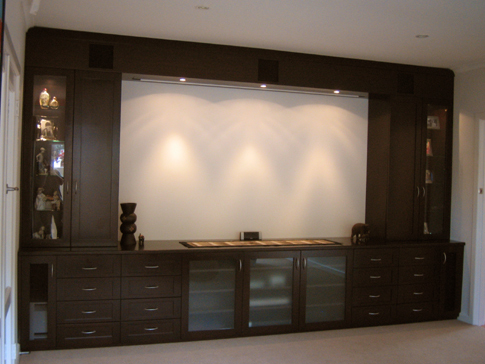 Complimented with furniture downlights, this piece of furniture is a real centrepiece to a home entertainment room. It is finished in a custom chocolate stain and 2 pack satin lacquer.